Russian natural gas pipeline prices at the German border reached a record low of $3.99 per million British thermal units (MMBtu) in May 2016, the lowest level since September 2004, and averaged $4.04/MMBtu in March-June of this year, according to data from the International Monetary Fund. Russian pipeline export prices are generally linked to the prices of crude oil and petroleum products with a lag of several months, and with declines in crude oil prices, natural gas prices have also declined. 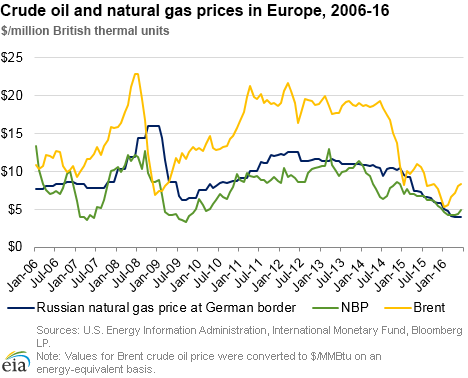 At the same time, spot prices at the key European natural gas pricing benchmark—the National Balancing Point (NBP) in the United Kingdom—averaged $4.86/MMBtu in June. Russian natural gas pipeline prices at the German border are now less than half of their levels at the start of 2015. Declining natural gas prices were accompanied by increasing Russian and Norwegian exports to countries in the European Union. Natural gas pipeline exports from Russia and Norway, Europe's two largest natural gas suppliers, have been steadily increasing since the spring of last year. In total, exports from these two countries to Europe were 16% higher in the last three quarters of 2015 as compared to the same period of 2014, and 23% higher in the first quarter of 2016 as compared to the same months last year. Exports from Russia increased by 56% in January-March 2016, while exports from Norway increased by 4% year-on-year, according to EIA calculations based on data from the International Energy Agency. 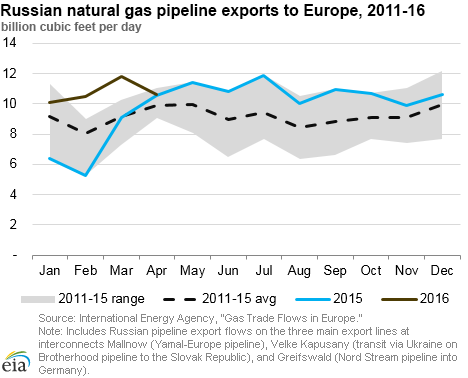 The largest increases in exports from Russia were in flows through Ukraine to the Velke Kapusany transit point in the Slovak Republic and on to Western Europe, which averaged 2.1 billion cubic feet per day (Bcf/d) higher in the first quarter of 2016 as compared to the same period last year, and flows on the Nord Stream pipeline to Germany, which averaged 1.6 Bcf/d higher quarter-on-quarter than in 2015. In recent years, Russia has been modifying contractual pricing structures in long-term contracts with European customers, increasing the share of spot indexation and using hybrid (both oil-linked and hub-linked) prices. In 2015, about one-third of Russian exports to Europe was priced based on hub indexes, as compared to only 16% of the export volumes in 2009-10. Norwegian natural gas export prices are already based primarily on European spot indexes, including NBP and the Title Transfer Facility in the Netherlands. 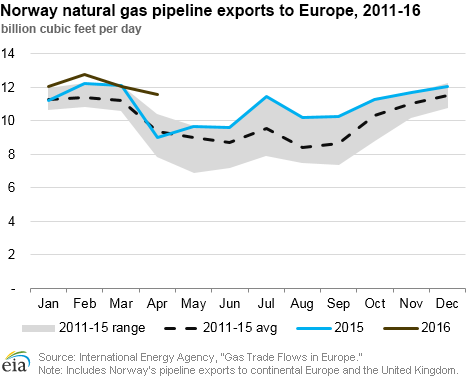 Last year, 80% of Norwegian natural gas exports to Europe were spot-priced. Natural gas spot prices rose at most locations outside of the Northeast this report week (Wednesday, July 6, to Wednesday, July 13). 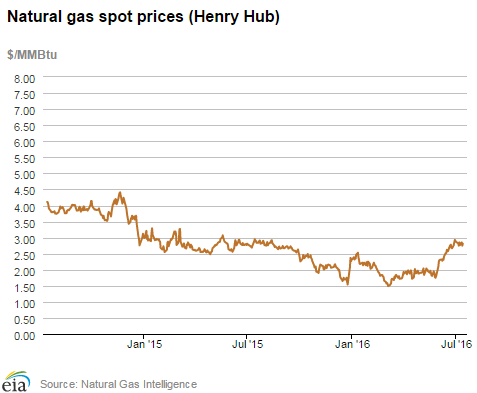 The Henry Hub spot price reversed last week’s decline, rising by 6¢ from $2.75/MMBtu last Wednesday to $2.81/MMBtu yesterday, to make up a third of the previous decline. At the New York Mercantile Exchange (Nymex), the near-month (August 2016) contract fell, losing about 5¢ and ending yesterday at $2.737/MMBtu. Net injections to working gas totaled 64 Bcf for the week ending July 8. Working gas stocks are 3,243 Bcf, which is 19% above the year-ago level and 22% above the five-year (2011-15) average for this week. According to Baker Hughes, for the week ending Friday, July 8, the natural gas rig count declined by 1 to 88. Oil-directed rigs increased by 10 to 351, the second consecutive double-digit increase in the oil rig count. The total rig count increased by 9 over the week. 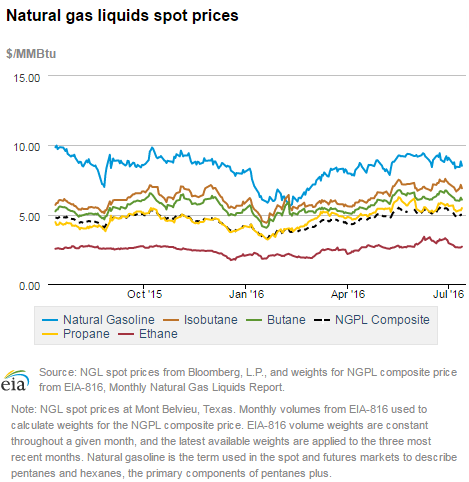 The natural gas plant liquids composite price at Mont Belvieu, Texas, fell by 42¢, closing at $4.99/MMBtu for the week ending July 8. The price of natural gasoline and propane fell 5%. The prices of butane and isobutane fell 8% and 7%, respectively, and the price of ethane fell 14%. Prices rise this week. Prices at locations outside of the Northeast generally increased this week. This report week (Wednesday, July 6, to Wednesday, July 13), the Henry Hub spot price rose 6¢ from $2.75/MMBtu last Wednesday to $2.81/MMBtu yesterday. Similarly, at the Chicago Citygate, prices rose 9¢ from $2.67/MMBtu last Wednesday to $2.76/MMBtu yesterday. Prices at PG&E Citygate in California rose more substantially, increasing 33¢ from $2.66/MMBtu last Wednesday to $2.99/MMBtu yesterday. Likewise, the price at SoCal Citygate rose 39¢ from $2.47/MMBtu last Wednesday to $2.86/MMBtu yesterday, and Rockies prices also increased by similar amounts. Industry observers attributed large increases in western prices to maintenance limiting imports from Canada. Northeast prices decline. At the Algonquin Citygate, which serves Boston-area consumers, prices fell 48¢ from $3.56/MMBtu last Wednesday to $3.08/MMBtu yesterday. Mid-report week, Algonquin prices had fallen to $2.07/MMBtu, likely on forecasts for mild weekend weather. Similarly, at the Transcontinental Pipeline's Zone 6 trading point for New York, prices fell 56¢ from $2.85/MMBtu last Wednesday to $2.29/MMBtu yesterday. 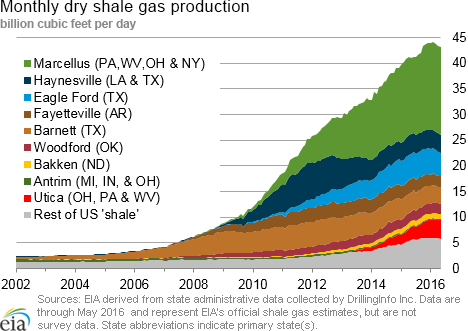 Marcellus prices decline. Prices also fell this week at Marcellus-area trading points. The Tennessee Zone 4 Marcellus price fell 16¢ from $1.46/MMBtu last Wednesday to $1.30/MMBtu yesterday. The price at Dominion South in northwest Pennsylvania fell 15¢ from $1.55/MMBtu last Wednesday to $1.40/MMBtu yesterday. Nymex prices fall slightly. At the Nymex, the near-month contract fell from $2.786/MMBtu last Wednesday to $2.737/MMBtu yesterday. The price of the 12-month strip (the 12 contracts between August 2016 and July 2017) fell from $3.075/MMBtu last Wednesday to $3.040/MMBtu yesterday. Supply is flat week over week. According to data from PointLogic, total supply of natural gas remained the same as last week, averaging 79.7 Bcf/d. Dry production remained flat week over week. Average net imports from Canada fell by 1% from last week. Liquefied natural gas (LNG) pipeline deliveries rose from last week, but remain a small contributor to overall supply. Power burn drives consumption increases. During the report week, total U.S. consumption of natural gas rose by 5% according to data from PointLogic. Power burn rose by 9% week over week, averaging 35.2 Bcf/d this week and making up more than half of total consumption this week. Industrial sector consumption remained the same as last week, averaging 19.5 Bcf/d. In the residential and commercial sectors, consumption remained the same as last week, averaging 7.3 Bcf/d. 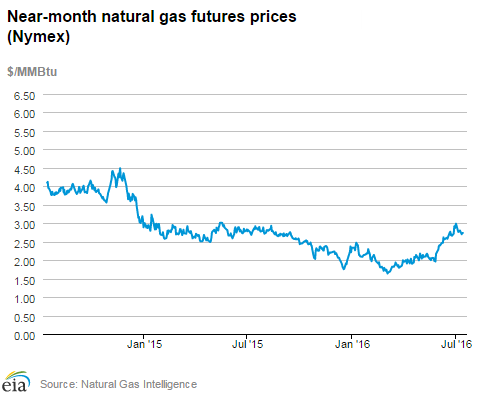 Natural gas exports to Mexico fell by 3%. U.S. LNG exports. The natural gas pipeline flows to the Sabine Pass liquefaction terminal averaged 0.66 Bcf/d, 1% higher than last week. One vessel (LNG-carrying capacity 3.0 Bcf) is currently loading at the terminal. Though this ship is loading, no ships departed the terminal over the period, and therefore no exports occurred. Working gas rises in the Lower 48 states with injections in every region. Net injections into storage totaled 64 Bcf during the storage report week, compared with the five-year (2011-15) average of 77 Bcf and last year’s net injection of 95 Bcf during the same week. Working gas stocks currently total 3,243 Bcf, which is 586 Bcf above the five-year average and 507 Bcf above last year at this time. After two consecutive weeks of withdrawals for the Pacific and South Central regions, both regions showed net injections this week. Pacific region stocks are below year-ago levels. Working gas stocks in the Pacific region are only 12 Bcf above the five-year average, after starting the refill season on April 1 with a 60-Bcf surplus. With the shut-in of the Aliso Canyon storage field in Southern California, storage stocks on the West Coast have been closely monitored by market observers, particularly as electricity demand reaches its highest levels of the season during the hottest days of summer. To address potential shortages, California continues to undertake several demand-response initiatives, which among other things include creating new energy storage, offering interruptible service for a discount, and deploying smart thermostats. The Pacific region is the only region in the Lower 48 states that is currently below last year’s stock levels. Spread to the January futures price remains stable. 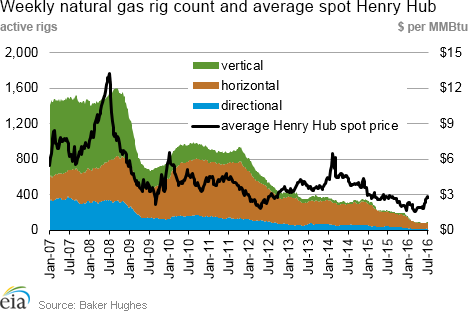 During the most recent storage week, the average natural gas spot price at the Henry Hub was $2.82/MMBtu, while the Nymex futures price of natural gas for delivery in January 2017 averaged $3.36/MMBtu, a difference of 54¢/MMBtu. A year ago, the premium was 43¢/MMBtu. The average Henry Hub price so far in the injection season this year, from April 1 to July 8, was $2.20/MMBtu, 20% lower than the average value of $2.75/MMBtu for the same period last year. Earlier during this year’s refill season, the premium exceeded $1/MMBtu. Stock change is on the high end of analyst expectations. Expected net injections for the week ranged from 46 to 65 Bcf, with a median of 60 Bcf, as reported by Bloomberg. This week’s median was noteworthy because it was quite close to the higher end of the range (65 Bcf). Prices for the Nymex futures contract for August delivery at the Henry Hub rose about 2¢/MMBtu to $2.76/MMBtu, with 329 contracts traded at the release of EIA’s Weekly Natural Gas Storage Report. 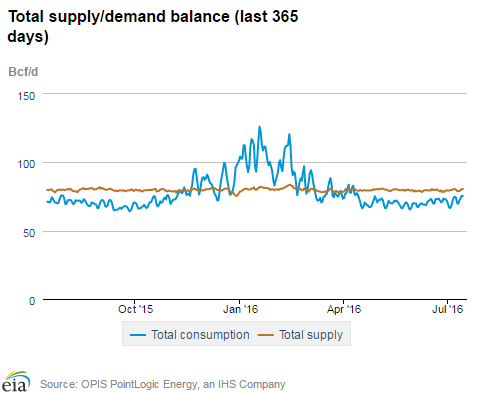 Continuing hot weather means elevated cooling demand for natural gas. Temperatures in the Lower 48 states averaged 75°F during the storage report week, virtually the same as last week. Temperatures during the report week were close to normal throughout most of the Lower 48 states, less than 1% above normal on average. Cooling degree-days in the Lower 48 states since the beginning of the refill season on April 1 were 19% above normal.